Vodafone and Airtel users in India will now be able to make purchases on Google Play using the carrier billing option, with Google extending the option to two of India's largest telcos. Customers can now purchase books, movies, apps and other digital content from Google Play, and use their carrier account to pay for the purchases. The purchases will be charged to and reflect in the monthly phone bill. The development was first reported by Android Police. Google first launched carrier billing for Idea customers in May 2016. In November, it added the netbanking option on Google Play, apart from debit and credit card payment options. Users can add the new payment option by clicking on the payment method tab in Google Play. They can select Vodafone or Airtel, after which an SMS will be sent to authorise the payment method. According to an NDTV report, the feature is live only for postpaid users at the moment. "Definitely providing users with one more option will help as not everyone has plastic money and by this you are expanding reach. Somewhere, it will help them increase their user base and also their revenue but the biggest question is, will it change consumer buying behaviour in India?" said Vishal Tripathi, director, Gartner Research. 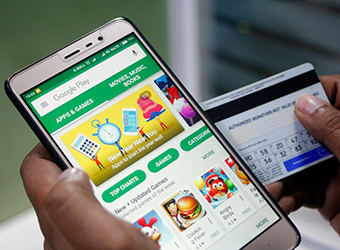 Earlier, a Reuters report had said that Google was sharpening Google Play recommendations using artificial intelligence and expanding support for various payment platforms. The report also added that Google Play will be expanding to new platforms including wearable devices, virtual reality headsets and Google's Chromebook laptops.